Mary Guedon of the group Raging Grannies holds a sign as she protests in 2010 outside of the Facebook headquarters in California. 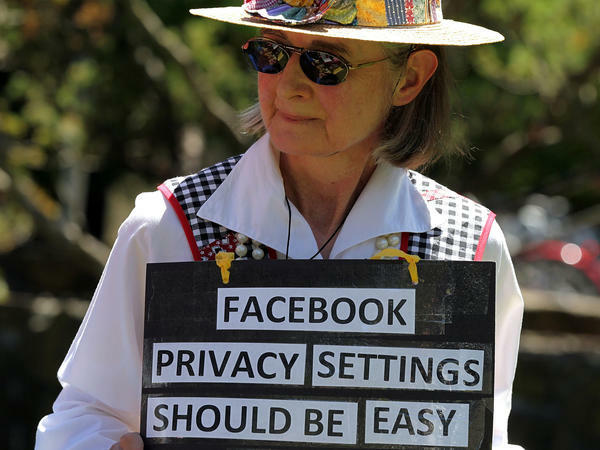 Privacy advocates say it's too difficult to fully protect your privacy on Facebook. The recent revelations that a voter targeting firm harvested the personal data of some 50 million Facebook users have left many people on that social network feeling uneasy. As NPR's Laura Sydell reports, there are some ways to better protect your personal data. But, ultimately, they may be limited. LAURA SYDELL, BYLINE: Shanna Carlile-Roy is a part-time student living in a remote area of northern California. She's on Facebook, but she's uncomfortable with its privacy policies. SHANNA CARLILE-ROY: I feel trapped with the site because it's such a form of connection that I've come dependent on. SYDELL: Carlile-Royspoke to NPR over Skype. She does try and use Facebook's privacy settings, but it's not so easy. CARLILE-ROY: You're expected to go and try to research it yourself, read through all the fine print. And it's still really elusive. SYDELL: There are a few things you can do. Let's start with apps. Cambridge Analytica got the user data through a researcher who had an app. Apps are one way your Facebook information winds up outside of its walls. When you use an app for a game, survey or anything, you're sharing your data. There is a way to stop this. Emory Roane is with the Privacy Rights Clearinghouse. EMORY ROANE: Immediately, users can and certainly should go to their Facebook page and check their connected apps. SYDELL: Go to settings. Click on apps. Click on apps, websites and plugins. You got that? And then you can just deny access to all apps. That's straightforward. Or you can deny access to certain details about yourself - your religion, your family connections, your interests. If you have Facebook on your phone, turn off location services. ROANE: If it's asking for your location information all the time or when the app is up, maybe set it to only when the app is up or disable it altogether. SYDELL: Or just don't use Facebook on your phone. Still, Terrell McSweeny, a commissioner at the Federal Trade Commission, says there are certain details that will be made public on Facebook no matter what you do. TERRELL MCSWEENY: Your name, your profile picture, your gender, your cover photo, your networks, your username are always publicly available. That's part of the policy of that website. JEFF CHESTER: You could spend all day trying to protect your privacy on Facebook. You wouldn't be able to go to work or school. You'd be spending your day full time dealing with Facebook. SYDELL: Jeff Chester is the executive director of the Center for Digital Democracy, which advocates for privacy rights. Chester does not think creating better privacy controls is the answer for consumers. CHESTER: I think for the average person, there is nothing that one can do to protect their privacy. SYDELL: Chester thinks Europe has the right idea. On May 25, a new law will take effect. CHESTER: Regulators in Europe are going to be able to come down heavy on Facebook, Google and the others, require them to get your permission first before they can use your data and create new limits on the ways that Facebook and Google and others operate. SYDELL: Chester thinks it'll be interesting to see if the new rules in Europe cut back on Facebook profits. In an interview earlier this week on CNN, Facebook CEO Mark Zuckerberg said he wouldn't object to some regulation of Facebook, though it seems unlikely he'd welcome what's about to happen in Europe. Laura Sydell, NPR News. Transcript provided by NPR, Copyright NPR.